"I can only record as a reporter what I saw and heard, traveling with the least fortunate but the bravest of my people," says the author. But I. F. Stone is not an ordinary reporter. He has the sincerity and the art to tell what he saw convincingly, without embellishments, yet losing none of its dramatic intensity. Simple folk and scholars, the tough and the gentle, crowd these pages; and in the author's vivid portrayal they become people you have known. Their storiestragedies which have destroyed all but the lucky remnants, or comedies which lighten even the most unfortunatetake on in reading the reality of events you have actually seen. 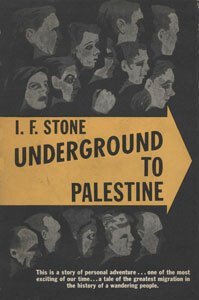 The author's underground journey took him from France into Germany, Poland, Czecho-Slovakia, Austria, Italy, and through the Mediterranean to Haifa. His account of that adventure is a gripping narrative, a record of historic value, and a story of dramatic force.